For anyone that knows me, they know that I live for vacations in which I can live in shorts, maxi's and bikinis. About 90% of my travels have some sort of ocean and beach frolicking involved. But this time, my husband and I decided to explore by car and ski the Swiss Alps and boy we were not disappointed. We became best friends with Waze, who helped navigate us from the mountain towns through the rolling hills and off to grandma's house we go, and by grandma's house I mean Zermatt. Zermatt is a car free town which is amazing so you can walk in the streets and ride around in a buggy if you wish. Side note, if you have Waze, have you ever switched the option to "Boy Band"? Its hysterical and makes getting lost way more entertaining. Get a pocket wifi. I got mine from Tep Wireless, and it arrived to me in NYC a few days before I left for Switzerland. It was around $95USD for unlimited data for a week and we needed this for sure because we were driving around everywhere and needed directions. If you don't already have the app Waze, download it now if you are driving and not taking the train. 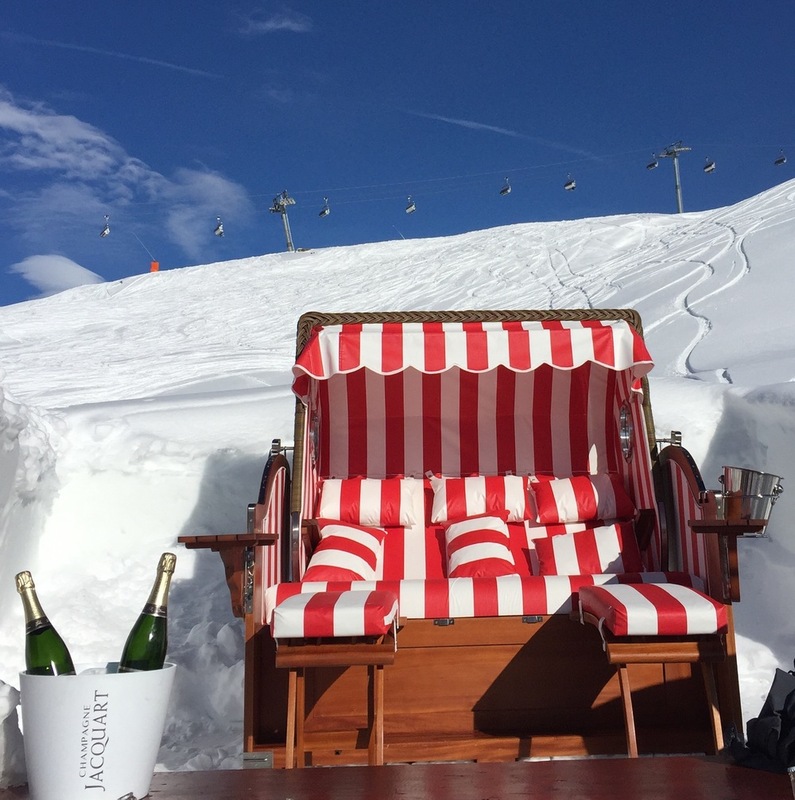 Skip St. Moritz if you are not a fancy person or if you are only planning to stay for a day. The town reminds me of the Hamptons; small, chic and very upscale. I believe during the summer there are sailing competitions there which is probably quite beautiful, but since we only had a day, it was not worth it. Davos is a quiet town but highly regarded for the snowboarder. I'd say a must if you love to hit the slopes and are more on the advanced side, you must board in Davos. Zermatt is incredible, you could easily spend an entire week here. Ski or Board as much as you can! If you go to Iglu-Dorf, ski in don't try to walk there. Its a tough 30 min downhill walk from Gornergrat. Go up to the Gornergrat and do a snow hike. Its unreal! Go to the natural spring spa in Brig. A great way to relax after a day of skiing. Fondu is huge here so get ready to get your cheese on. Stockhorn Grill: Delicious meat skewers with home made garlic butter, incredible. Restaurant Schaeferstube: Swiss hospitality and excellent rack of lamb and lamb stew. Don't try going without a reservation. Brown Cow Pub: Super relaxed and cozy ambiance after a day of skiing serving great beer and burgers. Tipping is not common in Switzerland. Waiters and other service industry people are paid very well, however, if you wish to round up on a bill, they won't be offended. Swiss Currency is Swiss Franc, CHF. Davos is about a 2 hour drive from Zurich Airport, not a bad drive at all. We rented from Sixt at the airport because we heard their service and ratings were better, and they were right, so now I am suggesting it to you all. In Davos, we stayed at Hotel Bellevue Wiesen, an adorable little mountain side hotel that felt like the coziest little ski chalet you have ever seen. Old school wooden skis line the wall of this adorable hotel and the lobby is set with a roaring fireplace, boardgames a fully stocked bar, soft leather lazy-boys and snowcapped mountain views. Right outside the hotel is a bus stop with a shuttle that will take you to the lift that is about 3 min away. Davos Plats is the "downtown" of Davos and is about 15 min away by car. In Davos Platz you will find casinos, restaurants and tons of souvenir and clothing shops. Zermatt is a car free town and a ski and snow paradise; it feels like you enter a entirely new world. Since we were driving, we had to park the car in Täsch, which is about 5km (12 min) away from Zermatt. Parking your car in a garage is about $15USD/ a day and then you must buy tickets for the "Zermatt Shuttle", which is about $8USD one way. The train runs all hours of the day, every 20 min so no need to worry about what time you arrive in Zermatt. Once you get into town, you will see how small the town is and that most all of the hotels are walking distance. We only had two small suitcases so we opted to walk instead of getting into a buggy. I highly suggest our hotel, Beausite Park Hotel, due to its view of the Matterhorn, service and location. We stayed in a suite that overlooked the Matterhorn and it was quite the magical view. In order to get up to the Matterhorn, you must take the Gornergrat Bahn from Zermatt. Tickets are about $75USD roundtrip per person and it makes several stops on its way up to the top. You can bring your skis onto the Gornergrat if you wish to get off and ski to the bottom. At the very top, there is a few small restaurants and a little shopping. On Thursday evenings, they offer "Dining Under the Stars" which I wanted to do, but we didn't happen to be there on a Thursday, so scratch that. There is a huge mountain area you can walk up to in order to get some great photos of the Matterhorn. Its truly a magical sight up there. Untouched glistening blankets of snow everywhere you look and in the middle of it all, the glorious sight of the Matterhorn in the distance. Clearly I turned into a child and built an adorable mini snowman, complete with Francs as eyes and arms. Wouldn't you know, mini snowmen are hard to build! Snow shoeing and snow hiking is really lovely up here since most all of the snow is untouched so I highly suggest doing a snow hike. We did one on an unmarked trail around sunset and it was a breathtaking hike, one of the best ones I have ever done! 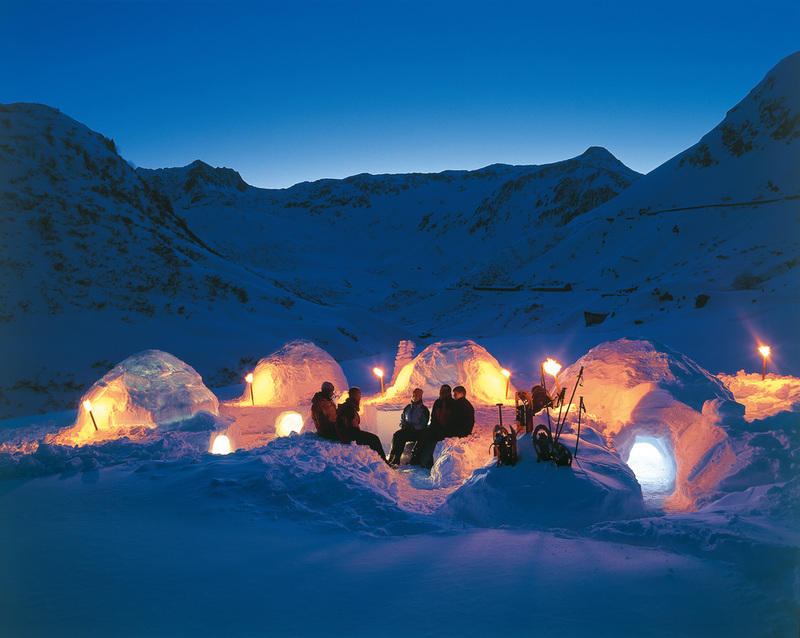 Iglu- Dorf is a man made Igloo Village in which you can walk to or ski into. They have sun loungers to sit and relax, a fully stocked bar, a hotel and some light bites. 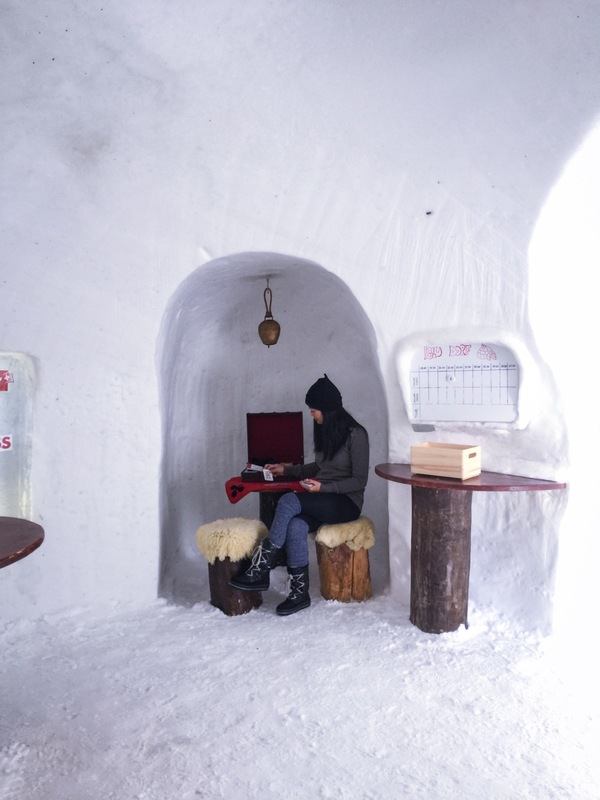 If you wish to stay in the igloos, you must make an advanced reservation here. The igloos are usually built within 2-4 weeks depending on the amount of snow accumulation, but its truly a sight to see! On our drive to Zermatt, we stopped in Brig, a lovely quaint old town with its cozy inns and charming shops will tempt you to stay longer than you plan to. In Brigerbad, about 6km from Brig, there is one of the biggest open air thermal spa centers in Switzerland called Thermalbad. It has a grotto outdoor fresh water swimming pool, water chutes and plenty of saunas and ice baths. The thermal pools are about 37°C with numerous under water massage jets and lounge chairs IN the water! JP and I spent about 3 hours here, it was heavenly. The crisp air and the heated thermal baths, with views of the Matterhorn in the distance, is nothing short of perfection. If you are driving to Zermatt, I highly suggest stopping by here to relax and enjoy the natural wonders of Brig. If you want to test your marriage for weak spots, rent a car, get lost over and over again in a place where nobody speaks English, add a snow storm and see results. (If you know what movie that is referenced from, we are new BFFs!) I think next time we will skip the car rental and go straight to the train. Switzerland, you were incredibly stunning and so hospitable and I can't wait to come back during the holidays!